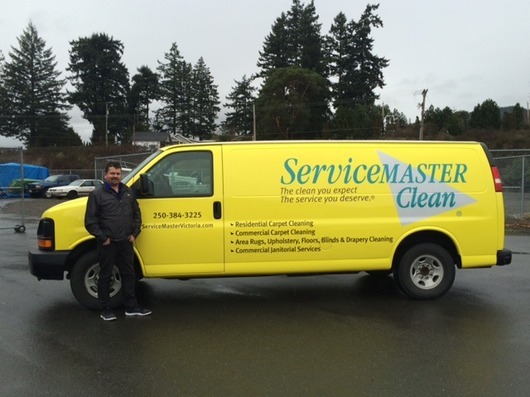 ServiceMaster Clean of Victoria offer specialized commercial cleaning services and programs trailored to your office needs, We are recommended by both carpet manufacturers and carpet mills and come highly recommended by all respected carpet, upholstery and area carpet retailers. We offer professional specialized care, backed by the wealth of experience and access to leading edge proprietary cleaning agents (specially manufactured for us by Dupont), cleaning systems and technology. We have developed a great reputation of both quality and value and are long term members of the Better business Bureau without incident. Many local carpet, furniture and area carpet retailers recommend our services to their customers. We enjoy providing a high quality service and the interaction with our many commercial customers. Our full time technicians have been with us a long time. Our expertise extends beyond janitorial services and carpet maintenance programs. We have added specialty blind and drapery cleaning with ultrasonics. We derive a lot of satisfaction helping people to sort out the various issues and misunderstandings that seem to be perpetuated about professional cleaning. Clean carpets and furnishings both extend the usefulness of it and improve air quality. 1. ServiceMaster is one of the largest, most experienced cleaning organization in the world. We have been serving Victoria for over 35 years and in Canada for over 50 years, and in 11 countries around the world. We are the recognized leader in the cleaning industry. All of our cleaning agents are formulated by us, manufactured by Dupont, and that means that you benefit from the very best quality cleaning standards. Our cleaning systems are the highest in the industry, ensuring you get the highest quality. We use state-of-the-art cleaning equipment, ensuring the highest possible results. 2. ServiceMaster is dedicated to giving customers the highest quality workmanship. Our technicians are certified by the IICRC (Institute of Inspection, Carpet, Restoration & Certification). Our firm is also IICRC certified. We are long-time member in excellent standing with the Better Business Bureau. We have ServiceMaster Clean’s highest Quality Assurance certification. The benefit to you, the customer, is that we have trained technicians to ensure the highest quality of workmanship. We are honest and have integrity, and we adhere to a strict code of ethics. We do not “bait & switch” or have extra charges, but charge enough to do the job right the first time. 3. We are a leader with environmentally conscious Green cleaning agents. ServiceMaster Clean has developed a line of food grade non-detergents that contain no VOC’s, corrosives, perfumes or dyes. They have the highest seal of approval from leading environmental organizations. SeviceMaster Clean products are safe for pets and environmentally hypersensitive individuals. “We do the job right, or its’ done again – no questions asked.” Service is our namesake and what we are all about. We are masters of service. We view problems as opportunities. We ask questions to understand the full scope of the work to make sure the price is accurate in our quotation, and your technician will ensure the price is accurate prior to any work performed. We follow up to ensure customer satisfaction after all work is completed. We are proud to never have had any complaints registered with the BBB, ever! We are fully insured and covered by WCB and have additional insurance well beyond normal coverage. We do the job right the first time! If there is dissatisfaction for any reason, we will correct it immediately. We fully stand behind our workmanship, ensuring piece of mind.